This tree is part of a four-way tie for largest tree in the Vanderbilt arboretum. It has a diameter of 146 cm (59 in. ), height of 28.5 m (94 ft.), and crown spread of 21 m (69 ft.). 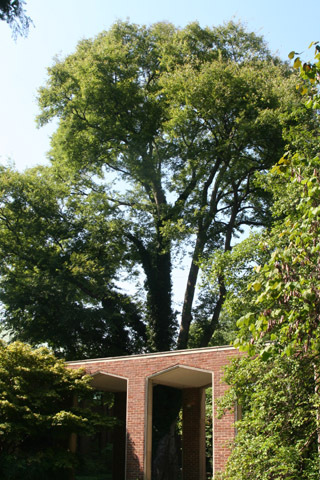 When the Divinity School was constructed in 1959, its courtyard was built around several large trees, including this one. The former state champion white oak grew next to this tree in the courtyard until 2008. Hackberry is one of the most common types of tree in the arboretum, although in this area, it is difficult to distinguish between the northern and southern hackberry species. This tree most closely resembles the southern species, also known as sugarberry. The name comes from the berries that are sweet, but which have a big stone and little pulp. The most noticeable feature of hackberries is the smooth, but warty bark. This organism is a living specimen that is part of the  Vanderbilt University Arboretum  with the local identifier 2-244.